Out with the Coke cans, potato chips, Twix bars and other junk foods. In with the Haruki Murakami novels. 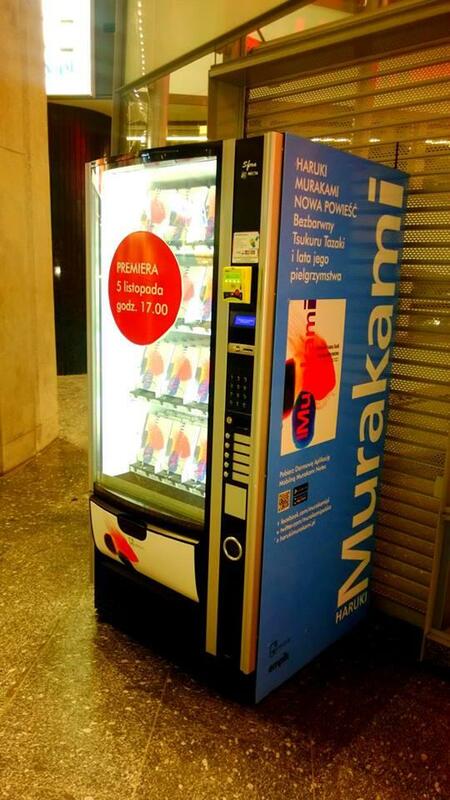 That's what happened last year when Muzu, a publisher in Poland, created three vending machines stocked with copies of Murakami's Colourless Tsukuru Tazaki and the Year of His Pilgrimage and then placed them in Polish train stations located in Warsaw, Poznan, and Wroclaw. It seemed like a natural thing to do, seeing that (notes the fan blog Haruki Murakami Stuff) Tsukuru Tazaki, the main character of the novel, "likes train stations and works as a train station designer for a Tokyo railway company." Let's cross our fingers and hope this is the start of a healthy trend. The actual name of publisher is Muza. Props to them. For what it’s worth, Muza is mentioned by name in the post. For any Polish reader Muzu does not make much sense, since I was unable to locate the actual publisher. But Muza is a different story – a well respected and established publishing house. The u ending is kinda misleading.